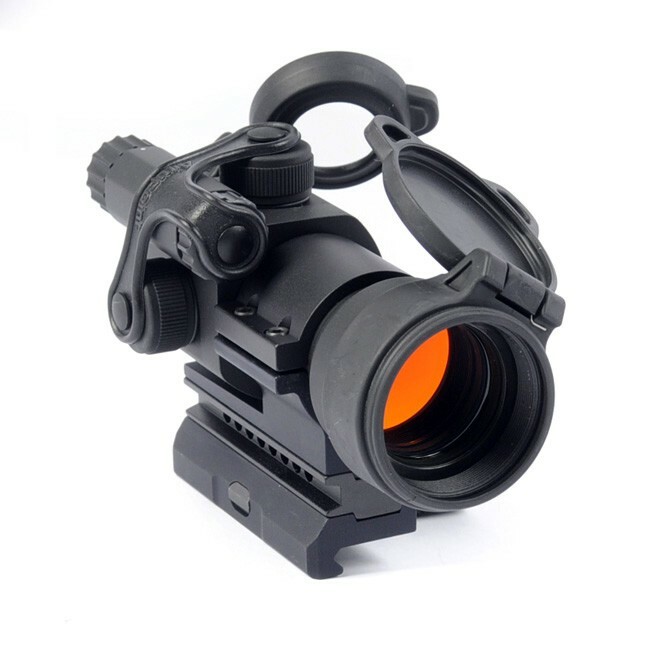 A red dot sight is a device that mounts on a gun rail allowing to look through an optical window to see a reticle superimposed in the field of view. The term “red dot sight” refers to any non-magnifying illuminated sight, including both reflex and holographic sights, that can be used on rifles, shotguns, and handguns. Its unlimited eye relief, a parallax-free feature and a great field of view speed up target acquisition and provides perfect shot accuracy and consistency. Aimpoint PRO Patrol Rifle Optic was designed to combine many never before seen features for high-quality performance within any the challenging environmental conditions. They sat that with this red dot sight you will truly “get more than you pay for”. Long-lasting battery needs no turning off and can last on for 3 years. The front lens features a unique band-pass coating, which allows the sight to be used with all generations of night vision devices. Moreover, all lenses are recessed within the sight body preventing from impact damage, scratches, and fingerprints. The modular QRP2 mount comes for free. Besides, it includes a removable spacer allowing you to place the sight at the optimal height for co-witness with the standard iron ones on AR15/M16/M4 Carbine style weapons or submachine guns. The sight has the clear rear cover, which enables to use the device even if the front cover is still closed. It is perfect in case you do not have time to open the one. It is claimed to be waterproof up to 150 feet. Click and buy this product on Amazon! This reflex sight is purely amazing featuring incredible low price and a coma effect due to spray rays. In fact, the brighter the target background is, the crisper the dot appears to be. In addition, adjustable illumination intensity settings will lessen any ghost imaging. The sight offers a crisp dot for professional precision shooting. It has a great field of view and an unlimited eye relief. 2 batteries come for free. The sight requires a screwdriver or penny to adjust windage/elevation. Some customers state that the rheostat is really stiff. Check the price on-line on Amazon.com! 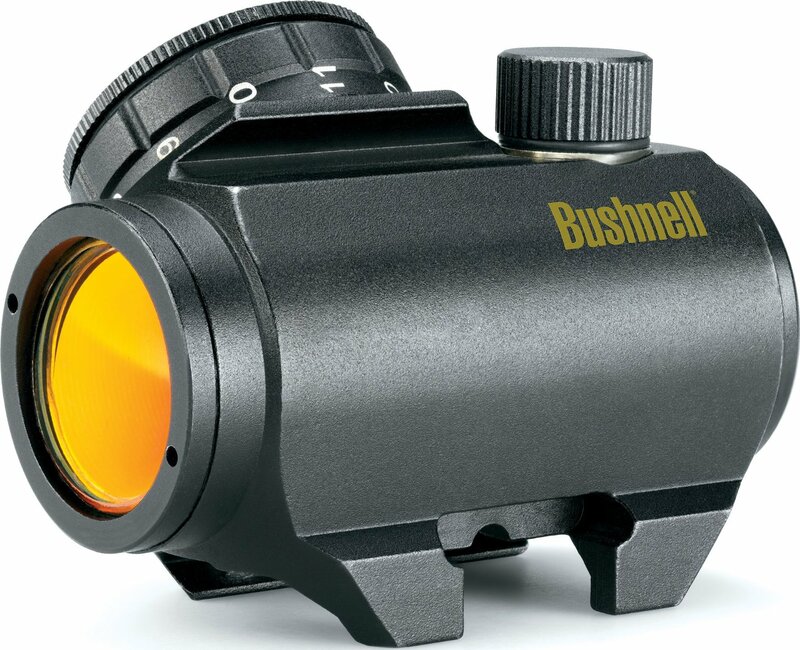 Bushnell Trophy TRS25 is regarded as one of the best red dot sights in the market due to its quality, performance, durability and reasonable pricing. The scope features an Amber-Bright high contrast lens coating to provide you with the best images. Tilted front lens reflects LED light to create a red dot. The sight is 100% waterproof/fogproof/shockproof. It can be mount on is any weaver or picatinny rail. This sight can be easily used with both eyes opened thanks to unlimited eye relief providing faster target acquisition. 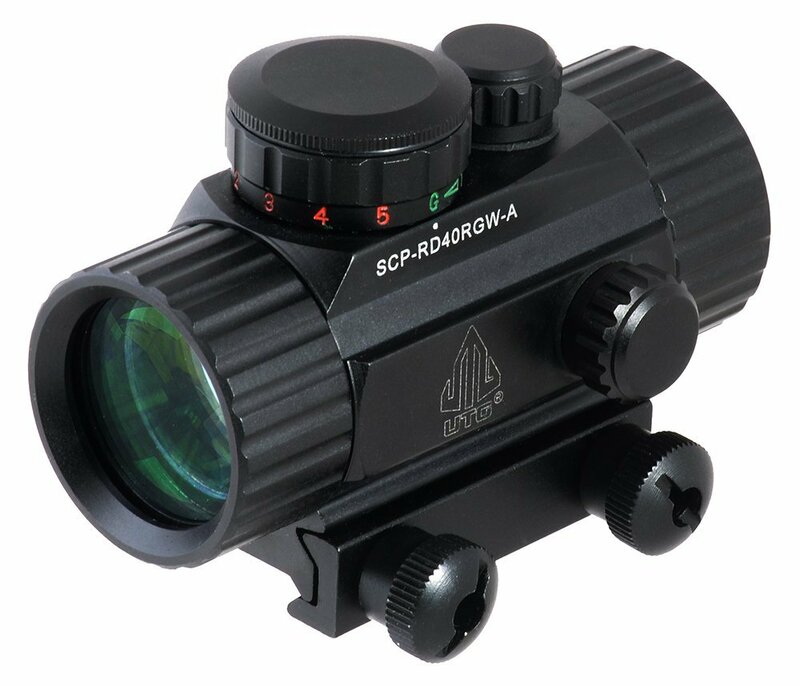 The scope is parallax free – the dot follows the movement of the eye while remaining fixed on the target. Red dot light source is secured inside the scope with an adhesive that partially obstructs the field of view. The red dot may appear blurry or misshapen if its intensity is set too high for environmental light conditions (most likely to occur indoors with artificial light). The battery life on the Bushnell cannot be compared to the Aimpoint model. You have to remember to turn the sight off when not in use. The brightness/power knob is hard to turn. The windage/elevation controls feel a bit cheap and the “clicks” do not seem to be very positive. Have a look at about 1800 customers’ reviews on Amazon! 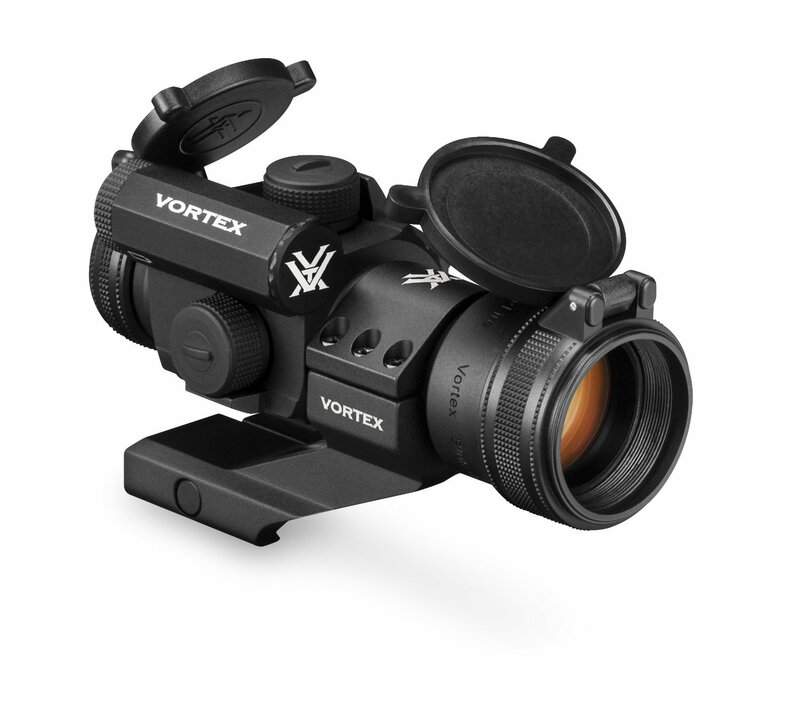 Vortex Optics StrikeFire 2 is a feature-rich, reliable red/green dot sight that will become an ideal choice for shooters who want to get a quality one, but do not want to overpay. The dot intensity is variable and has 10 levels. Besides. 2 lowest settings are night-vision compatible. The sight automatically returns to the last dot intensity after turning on and has a 6-hour auto-shutdown feature to maximize battery life. Parallax free design allows to shoot with both eyes open. Moreover, the item has an unlimited eye relief. The sight is able to stand an extra-high recoil and is water-, fogproof. CR2 battery, a cantilever mount, and flip-up lens covers are included into the package. The only shortcoming of the product is some hazing on high red or green settings. Check the current price on Amazon! 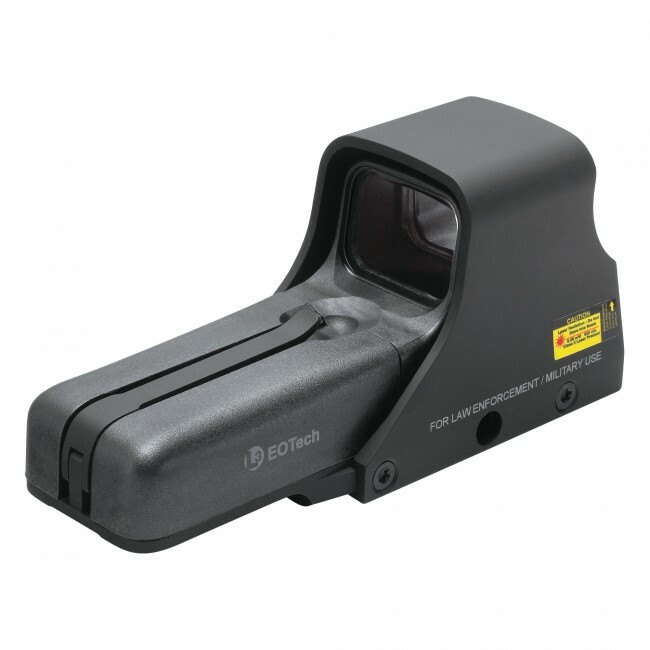 The Eotech 512 have become a very popular scope due to its technologically advanced laser light that illuminates holographic red reticle projected on the target plane. Moreover, the sight has widely adjustable brightness settings – 20 levels. It is definitely a perfect match for close interactions. The sight’s laser improves target acquisition and boosts accuracy. The optics feature an anti-glare and scratch resistant coating. An on-board microprocessor has an automatic battery check indicator and a programmable auto shutdown (8 to 4 hours). The package is completed with double AA batteries and tool-free mounting bolt. However, the sight also supports 1-inch picatinny or weaver rails. It is waterproof up to 9 feet. The evident drawback is short battery life in contrast to other sights. Talking about red dot sights, I did a lot of research about this and I heard a lot of people talking about this and I have read a lot of questions about this. So I would like to address a couple of issues about it. I hope this will be useful to you. First and foremost, here are some brains to avoid and some brains to look for: brains to avoid will be like “UTG”, “NC STAR”,”UAG”, “AIMSPOTS”; any of those warfare, or AR15 or any greater. The reason to avoid them is not because they are not worthwhile on sights. You may get one as much and find out that it works the way exactly you wanted it to and it will last you a long time. The problem is that if it is kind of crap shooting: 50/50 – hit or miss type of situation where you either get a good one, or you get one that constantly gives you problems. I wouldn’t be in the position to recommend something that is going to give you problems after sometime or even you taking a huge risk by buying it. It is cool when you spend your hard earned money. It should probably get you something that is going to last and worth it. Brands that I would look for will be like the Vortex Optics StrikeFire 2 Red/Green Dot Sight, or maybe Bushnell Trophy TRS-25 Red Dot Sight Riflescope; RioRand Generic Holographic Red and Green Dot Sight, Ohuhu OH-RG-SC Reflex Sight and many other good ones out there. Depending on the nature of the red dot sights, shots are made for fast acquisition and not made for 300 yards precision shots. The size of the dot: you must have noticed that anytime you read online, it will say three aim away dot or five aim away dot or whatever. Basically what that means it’s if you have a five aim away dot for 100 yards, it is probably going to be roughly a 5’’ inch circle. If you have a two aim away dots at a 100 yards, it roughly going to take up a 2’’ inch circle. Two aim away is pretty small for most people. If I was going to recommend the size of a dot, I will probably recommend four. It’s pretty small to make precision shots within the effect of range of a red dot, which to me it’s about a 100 yards, I wouldn’t take shots more than that with just a red dot. 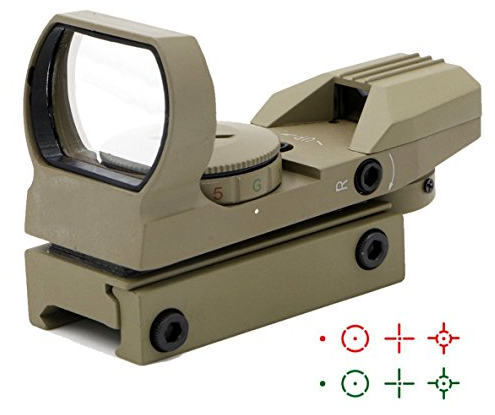 Now if you rock a magnifier, you will have to move forward the red dot to give space to the magnifier, but also at two aim away dot is probably going to be your best bet if you know you are going to use a magnifier. Reason for that is obvious if you magnify the red dot, it is actually going to be bigger, and you want that to be as small as possible if you are using the magnifier. So two aim away dot is what I would be recommending if you know what type of dot you are going to use on the magnifier. Otherwise, take two or four aim away or five aim away, I probably wouldn’t go anything bigger than that; but that will be the ones that I will recommend. At four aim away, you are going to have the ability to make a precision shot. It is also going to be extremely easy to pick up during the day time if you have a weaker eye. You will probably agree with me that when it comes to shooting, almost every shooter/hunter/gamer tries to be as much accurate as possible. Some people would like to place a coin as far as a 1000 yards and would like to take on the coin at a gaze and first breath with maximized accuracy. But that kind of shot is mostly made with the help of a scope. It is much understandable that some people might take a red dot sight and a riflescope to be the same. 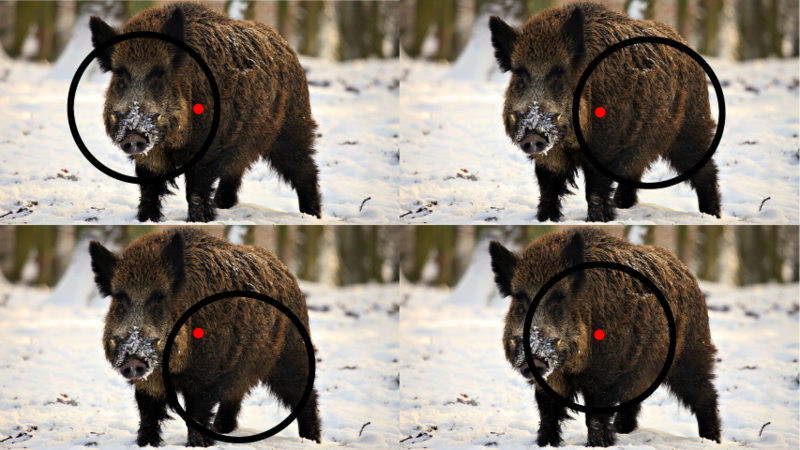 The answer is no: here is a simple difference between a red dot sight and a scope. Good at low light conditions Don’t work well on low light. But some are illuminated making them work in low light conditions. Note: a red dot sight is different from a scope. According to our differentiations above, you should know by now that red dot sights are used in some cases instead of the rifle scope and there are pretty cool reasons for that. Basic iron sight are fine but alignment of two points can draw your attention away and slow you down. Optics can help you improve your aiming abilities. Scopes offer three major kinds of enhancements, some scopes offer all three, some just two or even one. This helps you to aim quicker and hold target easier. Spots and aims at targets further away. Spots and aims through environments, otherwise not possible. A good scope dots at a virtual distance of 20m or more, while decent scopes sight at 10m to 20m. Poor scopes will sight at less than 10m. Some scopes use red dots and others use green instead. Some scopes use dots and other use shapes instead. Different scopes run on different batteries. These batteries can vary in their availabilities and cost. Big scopes can be bulky but tough, while small scopes can be agile but also more fragile. Scopes can differ in window size. Most scopes commonly use accessory rails. Most of 30mm scopes are fine for shooting at red dot type of ranges. Some maybe smaller, but it’s more appropriate for more compact weapons. Set your target within short distance from the point where you are taking the shot. Recommended distance is between twenty to twenty five meters and can be adjusted depending on individuals. Position your firearm on a solid rest. From the point you are, make sure the red dot is centered on your target. You should know the exact square to depend on based on your target view. If you are new on this, you should start by removing the caps on the knobs. Well that depends on the model or manufacturer you bought red dot sight from. 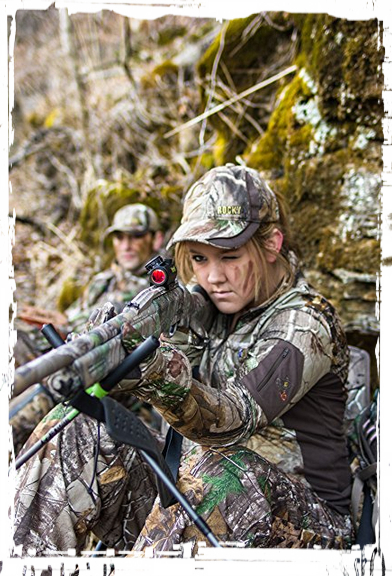 Sturdy: when buying a red dot sight, you have to look for one that is sturdy. Trust me, you probably don’t want to waste your money on stuffs that will break down after a short time you purchased them. 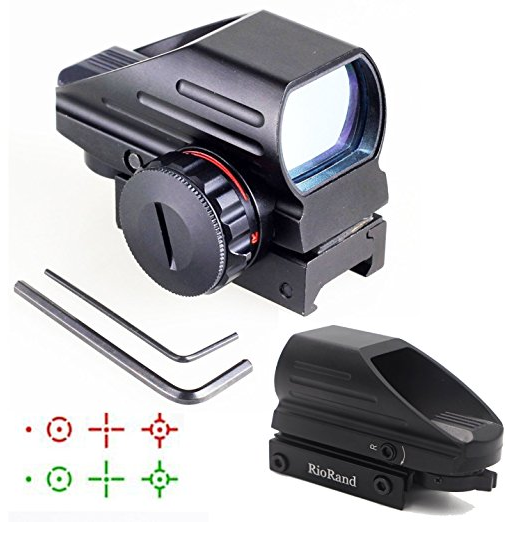 It is very important to consider buying red dot sights that are scratch proof so that if they happen to come across tough stuffs that might scratch the lens, you will be guaranteed about worrying less. 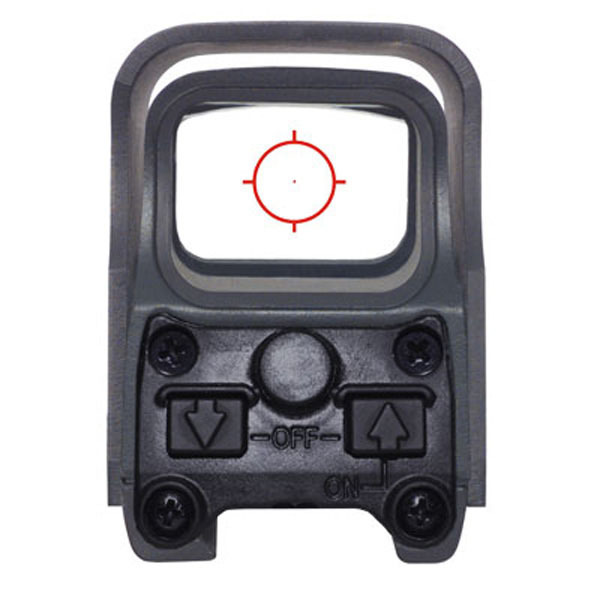 Consider buying a red dot sight that provides you good and clear dot. There are times when seeing the red dot might be tough due to circumstances. We hope that with all these informations and guidelines, this guide will be of a great use and help to you. 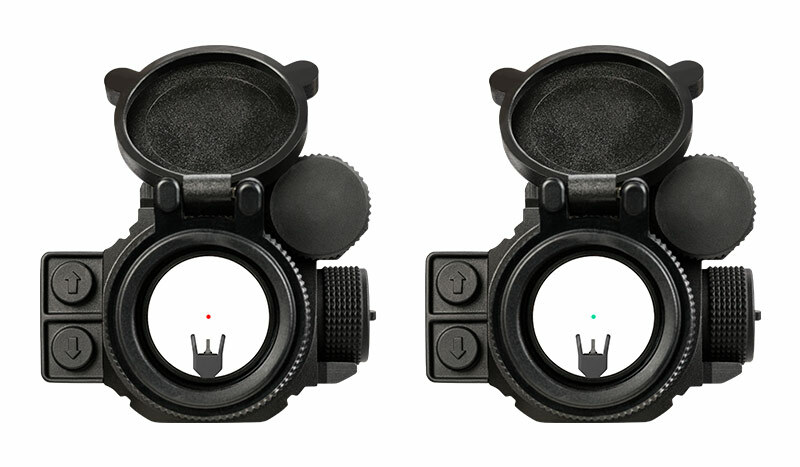 You will be able to shop for a red dot sight without cracking your brains much. You will be able to mount and explore your red dot sight without much contemplations. And above all, we are glad we could help if you find this article very useful – you are welcome. Back Is There Any Use In Buying a Rifle Scope With a Rangefinder?